Before the technology for dental implants existed, hardly any substitutes for a missing tooth were available. One such option used fixed bridges (which would sacrifice your adjacent teeth for the sake of your missing teeth) or removable dentures. Now with implant dentistry, we can restore missing teeth without effecting anything else. A dental implant can be compared to an artificial root that acts the same as a real root does. Titanium is what dental implants are commonly made of, a powerful and sufficient metal that the human body accepts. Old solutions to replacing teeth such as bridges and dentures have easily had there places taken by dental implants. Permanent teeth can than be created and put on top as soon as the jawbone heals. 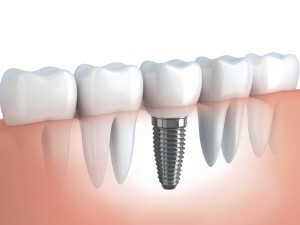 In a nutshell, the dental implant is infused in your jawbone acting as a replacement for the root of a missing tooth. A prosthetic tooth is then secured firmly directly on the implant, providing a solution lasting many years to the problem of missing teeth. Health and Beauty – Bone loss and bone shrinking are common side effects of a missing tooth. Implant dentistry can put a halt these effects and make sure your face remains in a natural shape. Comfortable – Unlike dentures, dental implants are secured tightly to ensure there is no movement or budging. The common negatives of dentures such as poor fit, gum irritation, and pain from exposed nerves are now a thing of the past. Confidence – Dental implants will make sure you are never ashamed of your teeth and have to cover your mouth when laughing, smiling, or speaking. You no longer have to worry about eating food that would usually cause you discomfort. You will leave more confident then ever before. In a typical exam, your dentist will carefully scan your teeth and gums for any signs of tooth decay, gum disease or any other health problems. It is also common to take X-rays to observe what’s beneath the surface of your teeth and gums. The images are then provided to your dentist and will help them discover any dental issues that are not seen by the naked eye. First, your dentist will inspect your teeth to determine if you have any cavities and to check the condition of any existing fillings. Your dentist will then perform a periodontal exam which studies your gums and makes sure your gums and teeth are connected tightly and that no periodontal disease or bone deterioration is taking place. In the next step, your teeth are carefully cleaned with different tools that eliminate any buildup from your teeth. Your teeth are then flossed with a polishing compound. 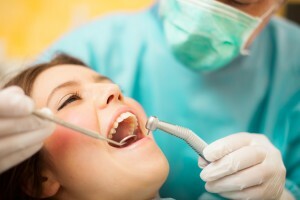 Let your dentist know immediately if you’re having anxiety at any part of the cleaning as they are not usually painful. Additional options can be provided to make sure that you are comfortable. If tooth decay or gum disease is found, they will inform you and give you tips on how to change your teeth cleaning habits. Antibiotics or other dental treatments might be offered if the case is severe. Using up to date dental technology and treatment techniques, we can assure that you will have the safest and most convenient treatment options to choose from. One of these options being the utilization of state-of-the-art digital X-ray technology. 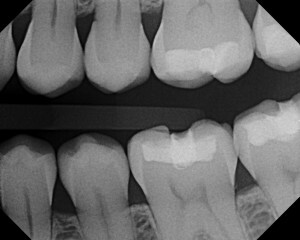 Digital X-rays provide many imaging options to save time, provide the clearest dental photos possible, and don’t expose patients to as much radiation as traditional X-ray technology does. We focus primarily on making sure your dental experience is as smooth as it can be. We’ll be happy to answer any questions you may have at your next appointment. Through taking proper preventive steps and maintaining good oral hygiene, you can avoid the damaging effects of gum disease. Please contact our office for a periodontal evaluation. Periodontal disease is a severe inflammatory disease that is caused by bacterial infection. The inflammation is a result of the body’s response to try to destroy and fend off the harmful bacteria. However, if the situation still lingers, this protective mechanism actually begins to become harmful to the tissues. The periodontal pocket, in periodontal disease, contains several substances that fuel this unhealthy condition. An ulcerated, epithelial lining that contains granulation tissue and bacterial by-products. What do we need to help with the healing of the pocket? All plaque and any other debris on the tooth must be removed to ensure a completely clean surface. Decontaminate all bacteria spread over the pocket. The main idea of a “filling” is to replace and restore tooth structure that’s been damaged because of decay or fracture by using a material. We will replace any old or worn out amalgam/metal fillings that have traces of mercury with white fillings (composites) to refresh your smile and teeth and give it a more natural look and feel. Using modern advancements, you will no longer have to go through the embarrassment of having unsightly and unhealthy silver/mercury fillings or metal margins. Get rid of the dark, black appearance in your teeth with new-age tooth-colored resin or other porcelain materials. Bonding’s strengthen the look of your teeth and raise your smile. As the name indicates, composite material (plastic), is connected to an already existing tooth. Composite bonding does not greatly harm your teeth in the process like veneers and crowns do. It is a quick and easy process that’s over in under a hour. It does harm the tooth or change it’s natural shape and is a cheaper alternative. Composite resins come in enough different colors to make sure that one of them will match the natural color of your teeth. Composite bonds, however, aren’t as durable and extensive as veneers and crowns and may need to be re-touched after some time has passed. Composite bonds require proper care and regular cleaning. To ensure a long lasting bonding, it is highly recommend that you brush and floss your composites daily. Be weary of common causes of stains such as coffee, tea, tobacco, and candy. All teeth darken over time. Changes in the color of your teeth can be caused by food and beverages such as coffee, tea and soda. Childhood medications or illnesses, tobacco use, and poor oral hygiene are all common causes of discoloration in your teeth. Restoring your natural white smile is a priority for our dental whitening team as we provide a variety of options to whiten your smile. 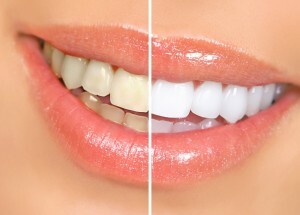 Tooth whitening services have been gaining popularity and have lately been in high demand. Due to this, a lot of “quick solutions” have been created that can be bought over the counter. In reality, these solutions can work very slowly if at all. Here we are trained professionals that use industry-approved methods. We try our best to adapt to the needs of every patient, while also understanding that each patient’s needs are different. One of the methods used is a gentle hydrogen-peroxide gel-activated solution. Our process will whiten your entire smile in just one visit. Call us today for a whitening evaluation. Nothing improves your appearance more than having a bright and white SMILE! The first professional option is in office teeth whitening. Performed in a dental office, an in-office whitening treatment uses a whitening lamp or whitening laser to enhance the effectiveness of the whitening gel by accelerating the peroxide. The Zoom In-Office Whitening System is often considered one of the fastest ways to greatly whiten your teeth. In a little over an hour, this both sufficient and safe system can give you the immediate results you want. A specific kind of light activates the gel which then softly breaks down stains on your teeth which rejuvenate your smile! Zoom Whitening is very safe, especially while under the supervision of a trained dentist. Although, pregnant women and children under the age of 13 are not recommended for this procedure. Tray bleaching uses both a special kind of tray and gel, both of which are available only through your dentist. The whitening gel is put in custom-fitted trays that fit perfectly each time. The gel breaks down and helps whiten any stained teeth. Unlike strips, this process actually whitens all your natural teeth and is intended to give you the maximum amount of comfortableness. At-home professional tray whitening can take 10-14 days, although you may see results in as few as 3-5 days. Over the counter teeth whiteners do exist, one of them a product called paint-on teeth whiteners. These are purchased over-the-counter and are mostly less expensive but less effective than whitening strips or other professional options. Paint-on teeth whiteners contain of a kind of gel that is enforced to the tooth using a brush. The gel then hardens into a film that coats the teeth, then dissolves in the mouth. It is suggested to talk to a dental professional before use, as is suggested with all teeth whitening options. Thin and flexible plastic (polyethylene) strips that have hydrogen peroxide bleaching capabilities are called whitening strips. They come in kits that include strips for both your upper and lower teeth. Putting the strips over your teeth and pushing them into place will activate the bleaching agent and ensures contact with all of your teeth. These strips are typically worn for 30 minutes a day, twice a day. How long the treatment lasts overall varies. Less expensive options include whitening toothpastes and mouthwashes that have been created specifically to have “whitening capabilities”. It is important to remember that they only affect surface stains, they do not actually lighten the color and shade of the tooth. Invisalign® is the clear way of straightening teeth using aligners instead of braces. Aligners can easily be taken off and on and are virtually invisible. This means your teeth can be straightened without anyone knowing; and you can eat and drink anything you want. You can also brush and floss as you would normally do to maintain healthy gums and teeth. Mouth abrasions cease to exist due to the elimination of wires, metals, and brackets. Many of our patients who had never considered traditional braces are now joyfully and comfortably improving their teeth with Invisalign®. Straightens your teeth without braces, and without anyone knowing. Several clear, removable, custom-made Aligners. Does not use any brackets or wires. Wear each set of Aligners a few weeks at a time. Easily removable for when you need to eat, drink, etc. Your teeth will gradually move each week. Pay your a doctor a visit every couple of months. Total treatment time can be anywhere from 6-15 months. Will go through about 18-30 Aligners. In the past, a tooth with a diseased nerve meant that it was lost. Today however, with a special dental procedure called root canal treatment, it is possible to save a tooth that has a diseased nerve. Root canals are a relatively simple procedure which is over in about 1-3 office visits. Having a root canal treatment when crucial can save your tooth and overall your smile! What is the function of a root canal? A tooth’s nerve is not vital to a tooth’s health or function after the tooth has come up through the gums. The only function it provides is to sense if something is hot or cold. Cracked teeth or teeth with cavities are prone to bacteria which can enter through your pulp tissue and can cause an infection inside your tooth. If not treated, an abscess can be caused. If the infected tissue is not dealt with soon, serious swelling can be caused. This injures your jawbones and can negatively effect your overall health. Your tooth may have to be removed if correct treatment is not undergone immediately. What signs show that a root canal treatment may be needed? Root canal therapy don’t always have to be painful. Some signs that may indicate that you need a root canal are toothaches, pain when chewing, pain in response to anything really hot or really cold, darkening teeth, and swelling and high sensitivity in the gums. Root canal treatments usually need anywhere from one to three visits to be completed. The first step is the removal of any affected tissue. Next, the inside of the tooth is cleaned and then closed shut. Lastly, dental composite is used to fill the tooth. Sometimes it is suggested to place a crown to harden and shield the tooth from breaking. Regular brushing, flossing, and checkups will make sure your treated tooth will last. Cavities are caused by the enamel(major tissue located in teeth) in your tooth decaying. This decay can eventually dig deep inside your tooth and damage its structure. If the damage is bad enough that a regular filling won’t treat it then a root canal treatment will be used to preserve the tooth and help it retain its old look; whereas in the past the tooth would have to be pulled. All patients go under anesthesia. A dental tool called a dam is to separate the tooth. Infected and dead tissue are removed. The tooth’s cracks and canals are all cleaned. Dental tools are used to reshape the canals. The tooth is filled with special and compatible material. The opening is temporarily covered. Restoring your tooth requires an immediate visit to your dentist. Veneers are unique in the way that they improve your smile without a treatment that actually affects your teeth. You will see improvements in your smile using veneers within two office visits maximum. For any other questions on veneers, please contact our office. Without all of your teeth, consuming food can unsettle your bite and cause you pain and restlessness which makes replacing any missing teeth a crucial thing to do. Missing teeth can also cause your mouth too shift and make your face look older. Implants are a life long solution to replace missing teeth. An implant is made to look exactly like a natural tooth, instead that it is actually made up of porcelain and metal. It’s made up of two parts: One is a titanium body that acts as the root, the second part is a tooth-colored crown that is placed directly above the implant. We guarantee that no one will ever suspect that you have a replacement tooth. Implants can also be used to anchor lower dentures that alter when your mouth is in motion. For patients with dentures, implants can replace your teeth in a way that ensures you a natural smile. Crowns are use to strengthen teeth and improve their shape. Crowns treat broken and worn teeth, as well as teeth that have suffered from tooth decay. Crowns are placed on top of the tooth and cover the space above of your tooth and above the gum line. Essentially the crown ends up becoming the roof of your tooth. Crowns are usually made of porcelain because of their strength and high resemblance to a natural tooth. Crowns are needed when the tooth is not even strong enough to support a filling. Crowns are made to be away from your mouth, whereas fillings are right in your mouth. Crowns are made in a lab based on your exact tooth impression allowing examination of your jaw and bite movements. Each crown is custom made for all patients to ensure the best mouth and jaw movements. Bridges can also be used to replace missing teeth, help keep your face in natural shape, and help you to not stress over your bite. We provide denture services that guarantee maximum comfortableness for each individual. 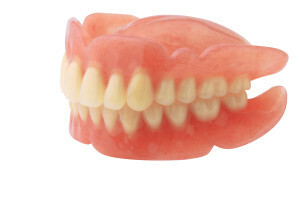 All of our dentures look good and feel natural. Dentures are removable, natural-looking replacement teeth. Dentures come in two different kinds: partial and full. Patients who have had most or all of their teeth removed are recommended for full dentures. 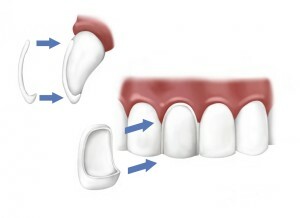 Full dentures are put in after the gum tissue around the missing teeth has healed, this can take up to several months. Full dentures are placed instantly after the teeth have been removed and sometimes requires adjustments during the beginning couple of months. Partial dentures on the other hand are connected to a frame made out of metal that is connected to your teeth and used to fill in wherever there should be permanent teeth. Partial dentures are also thought to be an alternative to bridges, except removable. Dentures are not always for everybody. If you’re interested about dentures and want to know if they’re right for you, we recommend you schedule an appointment. Our team will be more than happy to answer any questions you have, and from there we can decide what your best course of treatment will be. Dentures require daily checking up on so they can stay in good condition and keep away bacteria. When putting on your dentures, make sure you are standing over a towel or a sink just in case you drop your dentures. Dentures can also suffer from plaque and tartar, so brushing your dentures every day is mandatory. You should use a soft brush and gently scrub the top of the dentures, being gentle so that none of the plastic is harmed. It is also important to rinse your dentures following meals. Use a light hand or dish soap to clean your dentures. Look for an American Dental Association (ADA) seal of approval on products, these are the ones that are usually safe for you to use. When not being worn, dentures need to be kept wet. If not, they can lose their shape, crack and break. Some dentures require different solutions, so ask your doctor which will work best for you. Be sure to use a soft brush to clean your gums and tongue every day as well. If your dentures break, contact us and make an appointment as soon as you can. If not fixed properly, they can cause irritation to your mouth and gums. Also, remember to schedule regular dental checkups at least every six months so your smile stays healthy.